That is precisely what I did and, lo & behold things began to happen beyond my wildest dreams. As an artist or craftsman the thorny question of how to 'sell yourself' (horrible term) is the very nub of whether or not you can make a living from your work (or hobby, as the case may be) - and if you do earn money, how much you can make. Actually, the tips on this page apply to everyone, and certainly most small business ideas, but as I am a craftsman/artist myself, I come from that particular direction. 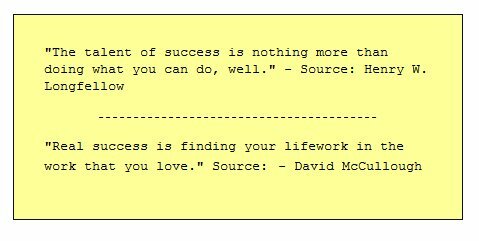 The point is, many people I meet have a secret desire to leave the 9 - 5 drudgery rat-race and work for themselves doing something they love. I was in that position once, but I am proud to say I did something about it. This page is the story of how I did it. In order to change your life and earn a living doing what you want to do (instead of giving your best years to a dog's life existence), means you don't have to pander to things that suppress you. The heart of your work should always be exactly what they feel most passionately about - the thing that makes you get up in the morning and smile the broadest of smiles when you think about what you are doing. OK, so given that you want to achieve the goal of freedom, you must be able to present your work to whoever matters in your brave new world with your best foot forward. That, I am afraid to say, is all about passionate and shameless self-promotion (of the right type - without it sounding like you are an arrogant fool who just likes to blow their own trumpet). This is where the skills come in. Most people have to learn these skills. Most people never do. Young people, in particular, find this skill hard - they tend to be either shrinking violets OR overcompensate for this lack of confidence by blustering with over-brazen swagger. Neither approach is good or will get you where you want to be. Older people begin to understand, but by then it may be too late - which is a shame because once you know the tricks, it is not at all hard (on the contrary, a simple set of steps, or checklist). To be frank, the vast majority of aspiring artists and craftspeople I have ever met are really rubbish at presenting themselves and their work. People who are high achievers in their field are naturally good at this side of things. I'll give you some concrete examples:- love him or hate him, English modern artist Damien Hirst, is a brilliant self-publicist. That's why he is at the top and internationally renowned. In his day, poor old Van Gough was rubbish at this aspect, despite being brilliantly gifted, so died a miserable death alone and not having sold a single painting. Ironically, both artists used sensationalism to get noticed, albeit one was deliberate and one was unwitting (and postumous). You may be relieved to hear you don't have to be sensationalist (alive or dead) to get noticed. I became a sought after and well paid figurine sculptor because I applied some simple rules of self-promotion (which most certainly did not come naturally to me I might add - I had to teach myself the skills!). 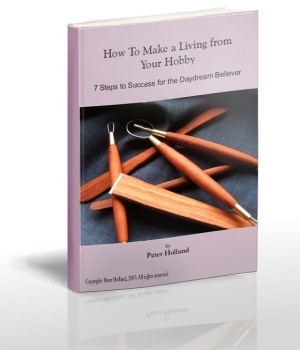 So self-promotion for artists and craftspeople is a learned behavior. If you have some natural talent at this, you can hone it and make it better. However, if you are pretty challenged at this skill, you can compete with the best - by learning a set of tricks (to place up your sleeve). As Socrates said:- "Let him that would move the world, first move himself. I will go through the basics on this page (below), but if you want something to keep and reference, you are best to download my ebook (recommended). It started out at an expensive $30.00 when I first published it (putting together an ebook is a very costly and time-consuming business), but due to popular demand, I am now able to sell it for a very affordable $7.99 USD (about £4.99 GBP pounds sterling). "I have a lot of determination, and I had a dream. I am not sure if I could have done what I did without Peter's input. After a life working as a successful architect, I finally saw my vision through." Please don't feel too daunted by the necessity of learning new skills in order to get to where you want to. It is doable. There are 7 basic 'Rules of Selling Yourself'. Rule 1 involves getting to know yourself a bit more than you already do (and being honest with yourself - no B.S.). What will motivate you? – it has to be something you love. The second rule is about how to not be a nodding donkey, but to look someone in the eye and keep asking polite but direct questions until you really 'get' where they are coming from. You can't solve someone's problem until you really have understood it. In a sense, you have to lose your own ego (or agenda), to achieve this. Rule 3 is about how you get people to trust you. You can't get people to help you or buy from you unless and until they really trust you - if you plant trust you grow credibility. Learning to clarify your value (rule 4) to others is not an obvious skill, but very necessary for success. Always get people to say or write things in their own words. Rule 5 is about 'Commitment' (getting it from others). The school of 'hard sell' calls this 'closing'. I don't adhere to that school, but you must get people to commit something to you (what exactly I explain further in my ebook). Rule 7 is about the importance of maintaining relationships. People, especially your customers and prospective customers need to be given utter respect, not treated like notches on a gun. Fear of failure? Lack of time? Too many commitments? The main reason, sadly, is most likely to be simply lack of action. Your interest, passion, hobby, skill (or niche market as it is known in some circles) can be harnessed to provide significant benefits to you in monetary terms. You just need a structure and a set of easy step-by-step instructions to guide you on your way. First step to take is to read my ebook, take notes and make a list of how the rules could apply to your situation. 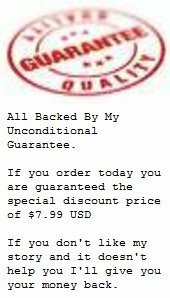 All Backed By My Unconditional Guarantee. The price was $29.99 USD (US Dollars), then $19.97, but if you order today you are guaranteed the special discount price of $7.99 USD (about £4.99 GBP pounds sterling). If you don't like my story and it doesn't help you I'll give you your money back.